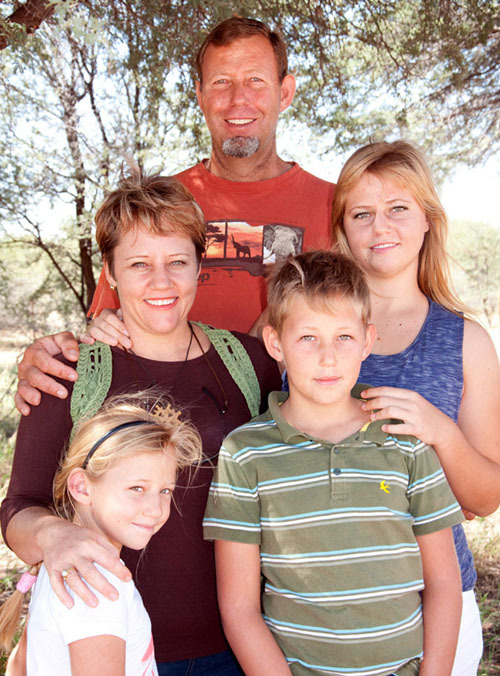 We are the Duvenhage-family and live in the Kalahari of Namibia, Africa. Uitspan is our hunting ranch and located on the eastern border of Namibia, next to Botswana. We border also the Kgalagadi Transfrontier Park in Botswana and from our accommodation facilities you have a spectacular view over part of the park. Long ago our ancestors were part of a huge immigration of farmers from South Africa. These farmers trekked long, arduous shifts with ox wagons. Whenever they found a place to overnight or a nice setting to camp for a period of time and also give the animals a good rest, they put up camp there. This action, to find a place to relax and rest, is called "Uitspan" in Afrikaans, our native language. UITSPAN is the name of our ranch and we do everything possible to provide every visitor to our place with that sense of unwinding and rest. As a family, we love to introduce visitors to nature and to our way of living. You will take home a lot with your actual trophies: pictures, friends, scenery, information on the Kalahari and a wonderful hunting experience. Hendrik is the owner of this ranch and started the conservation of wild animals on the ranch long ago. We honor him for that, since it incited in us a love and passion for these animals, for the Kalahari and for hunting. Hendrik has tremendous experience with all the animals of the Kalahari. He knows their ways and their behavior thoroughly. We are time and again astounded by his knowledge of every part of the ranch and the movements and location of all the animals at any time. During most of the safari's and hunting done with clients, Hendrik acts as driver of the vehicle (to locate animals). He does it with skill and ease, since this is especially the "territory" of our "old bull"! Isabel is the wife of Hendrik and a worthy and admirable example for any woman. 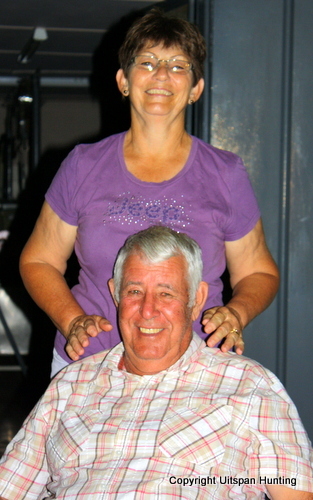 She loves her husband, her children and grandchildren and care for them in a very special way. In our business, she helps with cooking and the preparation of some of the meals. Under her hands every meal prepared for guests is a feast. Isabel maintains her home with flair and fine touches of decoration. You will taste and enjoy Isabel's dainty and delicious dishes. Michael is my DH (you know.... dear husband!) and the PH (licensed Professional Hunter) of our ranch. He is a nature- and animal-lover like his father, Hendrik. He grew up in and received refined education in the classroom of the Kalahari. By Namibian law, any hunter to hunt a trophy in Namibia has to have an accompanying PH to ensure ethical hunting. Michael appreciates and knows our animals and their customs and will enlighten your hunting experience with special information and knowledge. This will contribute to an unforgettable African trophy hunting adventure. 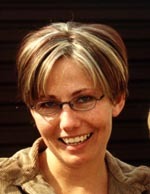 I am Tienie, married to Michael and we have 3 children: Maria (born 1998), Jan-Hendrik (born 2002) and Isabel (born 2005). I qualified as a Master Hunting Guide and also love to hunt. Our children however, need care and attention and I consider it as my main priority while they are still young. In our business I help Isabel with the preparation of meals. I also assist in other chores, such as the laundry and the cleaning of our accommodation facilities. Since any business has quite enough paperwork, I go through as the “secretary”. Our children also help with different chores and activities during hunts. They enjoy socializing with all the hunting friends from all over the globe. I started this website out of the sheer love and passion for the Kalahari, for hunting and for my family. Click here to read about the history and results of our website... YOU CAN BUILD A SITE TOO! of this unique region in Namibia. May the information on this website enrich your lives and make you aware of God and the wonderful animal kingdom he created for us to enjoy. We want to thank our sister Dina (picture on the right), who did the computer design of Uitspan's logo. Dina grew up on the ranch and therefore loves the Kalahari just as much as we do. The good artistic talents of Michael (who gave his ideas on the logo) and Dina, can be seen in the finished emblem.